Lindsay Popple published a new paper describing 14 new species of grassland, woodland & scrubland Myopsalta cicadas. Download it from Zootaxa. Volume: Zootaxa 4340 (1): 001–098; 2017. The genus Myopsalta Moulds is distributed throughout much of Australia. Previous studies have associated several undescribed species with the Myopsalta crucifera (Ashton) species complex. 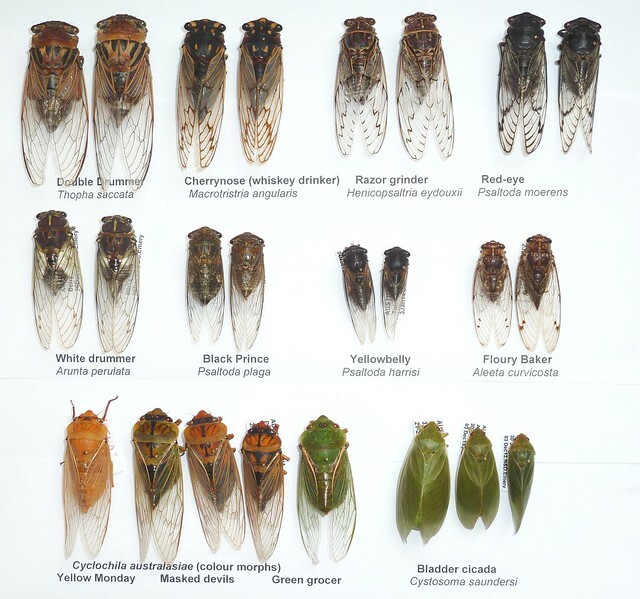 The present study informally divides the cicadas in the genus Myopsalta into two species groups. It provides a revision of the M. crucifera species group, which includes redescriptions of M. crucifera s. str. and M. mackinlayi (Distant). The identity of the latter species is further refined and attributed to material formerly presented under the name Myopsalta atrata (Goding & Froggatt). In addition to the redescriptions, 14 new species belonging to the M. crucifera species group are described, including M. albiventris n. sp., M. bassiana n. sp., M. chrysopedia n. sp., M. gordoni n. sp., M. leona n. sp., M. longicauda n. sp., M. majurae n. sp., M. melanobasis n. sp., M. parvula n. sp., M. platyptera n. sp., M. riverina n. sp., M. septa n. sp., M. umbra n. sp. and M. xerograsidia n. sp. A key to species in the genus Myopsalta is provided. Standard morphological descriptions and descriptions of calling songs unique to each species are included along with a discussion on different song types in the M. crucifera species group. Lindsay Popple announced on Twitter that two new species of Clinopsalta cicadas have been described. Sounds: Calling songs of Clinopsalta cicadas. Two new species are described in the genus Clinopsalta Moulds. Clinopsalta autumna sp. nov. exhibits a warm temperate distribution from south-east Queensland south to Goulburn and Nerriga in eastern New South Wales. Clinopsalta semilunata sp. nov. has a patchy distribution in southern Queensland from Binjour Plateau west to near Miles, south to Yelarbon State Forest and Durikai State Forest, both near Inglewood. In addition to the descriptions of these new species, further distribution records are provided for C. adelaida (Ashton), which extend its distribution from south-eastern South Australia and northern Victoria to inland central and northern New South Wales. 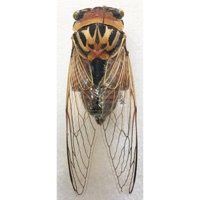 The species of Clinopsalta are small–medium sized cicadas (< 20 mm body length) with distinctive calling songs of an intermediate frequency (c. 6 to 18 kHz). The temporal structures of the calling songs follow a similar pattern in each species, comprising an introductory rattle followed by a series of clicking phrases. The call is characteristically accompanied with bouts of prominent wing-snapping, except in one species (C. semilunata sp. nov.). It’s Winter in Australia but I have two cool pieces of Australian Cicada news for you. First, Australian cicada expert and researcher Lindsay Popple has created a new website about the cicadas of Australia. Second, Samuel Orr has shared some video of cicadas from Australia and New Zealand on Vimeo. I believe this video will be part of the cicada documentary he is working on. Australia and New Zealand Cicadas from motionkicker on Vimeo. Update! L. W. Popple said on Twitter that cicada season will start in Australia in 1 or 2 weeks! Australia has 8 month long cicada season!